I’m usually in my pajamas by seven, and in bed by nine-thirty. A party animal I am not. But that night, when the concert hadn’t started by the promised seven–and then eight–o’clock I still felt awake. Probably adrenaline keeping me going. I hadn’t been so excited in a long time. This was the event of a lifetime for me. 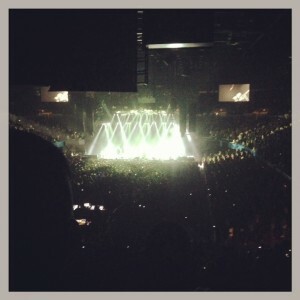 I could never justify the expense during the perpetual poverty of my twenties, so I had never been to a concert before. Truth be told, I still couldn’t justify the expense, but Mike knew how much this meant to me and sprung for tickets. It was time. They were coming to town, and who knows when I would ever get the chance again. There are four bands I would cut off my left hand to see perform live: Nirvana, Led Zeppelin, Alice in Chains and Pearl Jam. As the first three bands have key members who are now dead, I wasn’t about to throw away the chance to see Pearl Jam play live. So there I was, sitting in the top tier of the L.A. Sports Arena, center section with a decent (if far off) view, waiting for the show to start. I fidgeted, looking around at the crowd. Were they as excited as I was? Did this mean as much to them? When the murmuring crowd came to life as the band took the stage, I arose and didn’t sit again for the remainder of the evening. I felt like my nervous energy would crawl out of my sleeves and leave me in scattered bits on the arena floor. As the music started, I became a different person. Off came the shackles of self-consciousness and the weariness that accompanies impending middle age. Gone was the extra weight around my hips and the alcoholism that makes me feel uncomfortable in my own skin. The twelve-year-old girl first discovering music of her own came back to life. Music had been a fast love for me, and consumed me during my early teen years. I spent all my hard-earned money on tape cassettes, nearly wearing them out as I replayed my favorites. When I temporarily abandoned the piano for a guitar, I practiced the easier melodies over and over, hoping it would transform me into a part of the songs I so loved. Hearing the words to their opening song, “Oceans,” instantly erased all the carefully cultivated cynicism of the past few decades. The psychological crap I’ve accumulated over a rocky adulthood simply disappeared as the music engrossed me. When I recognized the familiar beginning riff to “Corduroy,” I couldn’t help but start moving to the music. Singing along to “Elderly Woman Behind the Counter in a Small Town” with the rest of the crowd, dancing to “Lightning Bolt“–I had fun, more pure fun than I remember ever having. Now, don’t mistake me when I said I felt twelve years old again. Though nearly twenty years melted away, the insecurity of being a teenager wasn’t there. You know, the awful crap that makes most of us just want to fast forward to years without acne, braces and awkward conversations with boys. No, I just felt…lighter. Yes, lighter. During that concert, I remembered what the best of youth felt like. To be open to love and excited for the possibilities. It also didn’t hurt that Pearl Jam is extraordinarily talented, plays together with undeniable chemistry, and possesses the highest qualities of musicianship. So yeah, it was a good show. 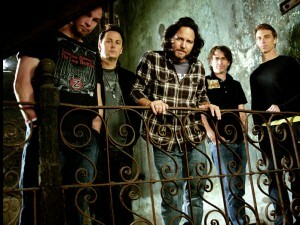 I would LOVE to see Pearl Jam perform! I’m totally jealous. So glad that you got to have this experience. What an awesome gift from Mike! I KNOW. It’s pretty freaking awesome. I am glad you had fun watching your favorite musicians. I’d do the same if I could watch my favorites live. Funny, how I grew up in Washington, own EVERY album, quote their lyrics (love the words of Oceans, Sometimes, Better Man, Black, Wishlist, Just Breathe, etc) and yet I have never seen them in concert. What’s wrong with me? Glad you got to be a kid again. I recently felt the same way at a Jars Of Clay concert (yeah they’re still around and have matured with us thirty-somethings). Not sure why mainstream music turns on bands after their third albums, but some bands only get better with age. Chris plumb recently posted…Ten Gifts to Never Give on Christmas (How to Become A Good Gift Giver). What’s wrong with you, indeed? 😉 It was an incredible experience. I was at a loss for words when writing about it, and I still kind of am. I am so glad it lived up to your expectations. Not that I didn’t think it would but I get a little nervous before a concert that has so much meaning for me, and I knew this show meant a lot to you. I’m so jealous! I’m sure that was such an awesome concert! I felt the same way at a Metallica (for real) concert about 8 years ago. Light. Free. Young… love love love…and I want to go to a concert! I LOVE Pearl Jam! I know the feeling you’re describing, saw Elvis Costello about a year ago and felt the same way. Sounds like a fun time! I imagine my wife feels the same way when she sees her favorite band: U2. I admit, I don’t have a musician or group that I feel that way about. Probably because I was all over the map with my musical tastes (the closest might be Weird Al, if that says anything 😉 ). Great post and I’m glad you had a great time! Oh, U2 is pretty fantastic, too! How lovely that you got to go to a concert that you enjoyed so much after waiting so long for your first experience! Grr…I hate it when that happens. Mike wanted to see Fleetwood Mac when they were in town, but we found out too late. So glad you had a great time! I love Pearl Jam too. Oh man, I feel your pain on that one! I started listening to Nirvana the year after Kurt Cobain committed suicide, and was always disappointed I’d never get to see them play. I can imagine how awful it would feel if it were Zeppelin! Zeppelin is right up there for me too. Marcy’s comment reminded me of listening to some of my friend’s older brothers talk about Bonham dying. I was 11 and they all said that Zeppelin was the best ever so I was disappointed. Have never gotten tired of listening to them so I suppose disappointment isn’t totally off, wish I could have gone. 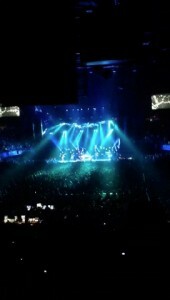 Anyhoo, it sounds like the Pearl Jam show was awesome, that is very cool. I almost bought tickets, but it didn’t happen his time. Jack recently posted…How Do You Only Make Good Decisions? What a great experience! 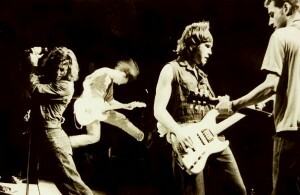 I saw Pearl Jam in college, which – gulp! – was now 20 years ago in 1993 and it was amazing – an outdoor concert outside of San Diego. Glad you had a great time!! Aw man, I loved Pearl Jam. It takes me back to college – so much fun I had those years – wearing my grunge plaid flannels. Good music! I’m not the hugest Pearl Jam fan, but I’m sure the show was amazing. Nothing compares to seeing live music, especially when it’s one of your favorite bands. Michelle Longo recently posted…Orange Is The New Identity Theft.